From the acclaimed author of The Shape-Changer’s Wife comes a stunningly beautiful novel of a distant future–where the fate of the world rests in the voice of an angel. An age of corruption has come to the planet of Samaria, threatening that peace and placing the Samaritans in grave danger. Their only hope lies in the crowning of a new Archangel. I’ve been told quite a few times in my life that I don’t know how to just turn my brain off and enjoy myself. For example, I can’t watch comedy movies because they inevitably annoy the *#*^ out of me. I spend the whole movie thinking “come on, no one really is that stupid.” I just can’t turn my head off enough to enjoy their moronic qualities. I guess a few types of books could fit into that genre as well. You see, this is a problem I have. If I can’t turn my brain off long enough to just enjoy something for what it is (book, movie, whatever) then I’m automatically missing out on tons of books and movies that may be good quality but I just can’t handle for one reason or another (that generally boils down to whatever it is, is just far too ridiculous to be believable or tolerable). I blame my overactive though processes. Others may pick other things to blame it on. Whatever it is, it does affect enjoyment. Which is why I have to review this book different than I normally write reviews. If you read this book for no other reason to just enjoy it for what it is you have a high probability of really liking it. This first part of my review would be my “surface level review” of Archangel. Shinn is a good writer. She quickly hits an easy flow in Archangel which makes it incredibly easy for the reader to get sucked into this character driven story. Her world isn’t incredibly vibrant, but it’s also a character driven book and obviously borrowed heavily from Christian traditions and locations which, I’m assuming, are in the Middle East due to their place names (like Sumaria). These two things combined insure that the world really doesn’t need to be incredibly vibrant or well drawn for the book to be enjoyable. Thus, Shinn allowed herself to spend a lot more time on plot pacing and character development than being bogged down by world building. The plot is incredibly, almost painfully predictable but that’s not why you read it. This, to me, seems more like a feel-good book rather than anything that will require a lot of thought or surprise you with its epic twists and turns. It follows the same path as many other romance stories follow. Thus, readers will be pulled in with Shinn’s unique world, vibrant romance and fluid writing rather than the actual structure of the plot. Now, if I was to probe deeper within Archangel and review it on the level I typically read a book I will say that Shinn’s obvious talent for writing is the only saving grace for this book. She truly is a talented writer who knows when to balance character development and world building. She managed to keep readers interested in her protagonist(s) while keeping them well informed of interesting cultural aspects which immerse the reader in the world she has created. However, after that it all falls apart. The plot is so predictable it nearly gave me a headache. Within the first page (literally) it’s obvious what lines the plot will follow and how Shinn will build the relationship between characters. Within the first chapter, even though you haven’t met Rachel yet, you know what she’s going to be like. There aren’t any secrets here, and Shinn’s lack of any unique qualities in her book was incredibly disappointing. Not all romance books are bad. I know it must seem that way from my reviews of them, but it seems like often writers take their time insuring good, lyrical prose and thus spend far less time on important plot points, world building and character development. If Shinn had spent as much time on her plot as she did on her prose, this book could have been a hit. I should, in turn, mention the world building. The world had to be the most frustrating part of this book for me. It’s labeled as science fiction in my local library but there isn’t much that’s science fiction about it. It’s more like a fantasy novel with a few passages talking about a sciency type device, which is fine. It’s the blatant borrowing of the Christian tradition that I found more annoying than anything. The gods name is Jovah, the place names are letters off of places in the Bible. 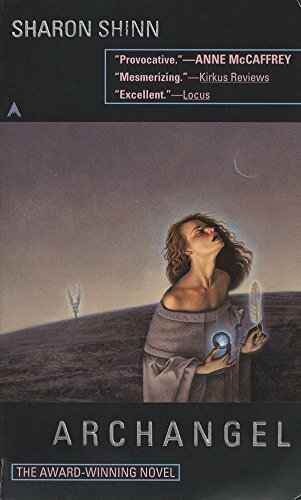 I understand using common cultural themes to insert into a novel to make it more familiar to readers and maybe play on cultural norms but the way it was done in this book was just absolutely tired and stale and pushed the book into the “nothing here is unique” zone. And yes, Archangel came off as insultingly preachy during several points. I can’t decide if Shinn wasn’t trying to hide her obvious flaunting of Christianity in this book; or if she just didn’t care how Archangel would be perceived; or if she was trying to create something new and failed in epic proportions. Let me make this clear, I have no problems with books that have Christian themes at all. Many of my favorite books have thick religious themes in them; but Shinn needed to make a decision before she wrote this book and it’s that lack of decision that I find the most frustrating. If you want to write a historical fantasy book, then do that. It seemed like Shinn couldn’t decide if she wanted to write a book in a new world she built or if she wanted to write a book set in the Middle East and so she threw the two together and it was an absolute world building and cultural mess. Characterization is another point I should touch on. Neither of the characters ever really develops. While there are hints of a budding romance thrown in, and the reader will know where the story is going from page one, the actual romance of Archangel was shockingly contrived and unbelievable. The reason is because Rachel never stops being stubborn for the sake of being stubborn and Gabriel never stops being whatever he is. That last sentence is important. While Gabriel is a presence in the book and has dialogue and is given a fair amount of time, he never steps away from being just a pale image. He’s never really developed outside of the obvious features a character needs. He doesn’t really have a personality. When the book ended I knew him at the end about as well as I knew him on the first page and his realism was knocked down a few notches over the 350ish pages of Archangel. Rachel, while having plenty of time spent on her in the book, never quite grows out of the petulant teenager she is portrayed as in the first fourth of the book. What I’m saying is neither character ever really move on from their first portrayal. While this works on the surface, deeper down this gaping characterization flaw really throws a cog in the wheel of progress and hugely hinders the development of the plot. All in all, I think it’s obvious that I really didn’t enjoy this book but readers who want a heart throb, feel-good story and are willing to enjoy it for nothing more than for its surface qualities will probably love this book. Shinn’s lyrical writing is enjoyable and her romance does have potential to tug at the heart strings. If, however, you tend to be a deeper reader into characterization and world building and like to be able to think about your books (and enjoy them to be unique instead of obvious parodies of current cultural traditions that are thrown together in a messy hodgepodge), I’d stay clear of this one as Shinn’s skill for fluid writing doesn’t cover up the numerous plot, world and development problems. I'm not sure why you gave it a full 2 stars. I may just pass on this book. After the discussion on Twitter with you and others, I edited the rating to 1 star. Some people absolutely love this book. I can't figure out why, but to each their own. I guess I"m in the minority opinion on this one. I happen to be one of those who really liked "Archangel", but I agree with you that the science fiction label is misleading for this particular book. For the next book "Jovah's Angel" the label makes more sense. In terms of overall structure, this series is a lot like Anne McCaffrey's Dragonrider of Pern series or Marion Zimmer Bradley's Darkover series. I did really like Gabriel and Rachel though. They're both such infuriating, frustrating characters because they have such a hard time changing, but for me, that was a lot of why I liked them. The changes that do occur happen grudgingly, but they do finally happen, so I was happy. But that's just my opinion! This was a very good review, and I understand why you make the points you do. Emily, I fully realize that I am completely in the minority on this one. I guess the book just hit a few nerves which I didn't expect because it has such amazingly high reviews. I was really very hesitant to review this book because I generally don't enjoy reviewing books I didn't like reading but it's on my "tell me what to read" list and I promised to work through that and post my reviews of those books. Books are like art. Not every painting will please every viewer and it's the same with books. While I can enjoy the art of the book (I really did enjoy Shinn's writing style), I just didn't appreciate the overall picture, I guess. Hey, I'm not a big Monet fan (the painter with the bridges and lilly ponds) either. But I still recognize him as an incredible artist. I hope that makes sense. Regardless of how our viewpoints differ, I respect the fact that most people do enjoy this book and there is absolutely nothing wrong with that. Of course we can't love every book. We all have our likes and dislikes. Therefore we tend to read reviews written by people who share our own taste. Fortunately there are always differences. I must admit that I would never have read this book. And after reading your honest review I feel validated in my opinion. Negative reviews are hard to write…but the mark of a GOOD reviewer is someone who can tell you what IS GOOD about the book they didn't like even while telling you all the things they didn't. Most current well-known movie reviewers/critics can't do this. They just hate or love and don't spend any time finding the good and bad and fleshing them out. Sarah, you continue to prove how skilled you are as a reviewer. This is a great review that touts why some would like it and some won't. Impartiality at its finest my dear. Well done. Scott, that's one hell of a compliment. I'm not even sure what to say besides "thank you" on that one. I appreciate it.